We consider patient education to be one of the most important pieces of treatment at this facility. If the patient does not understand why we are doing what we are doing, and why we are asking them to do certain things during their rehab process, then the resultant resolution of symptoms will not stick. It becomes an essential part of treatment that the patient understand, and agree with, all aspects of the treatment process and the role that they have to play in the process. We have excellent long term results with our patients, regardless of the length of time the issues have been present, which makes this facility unique. Many patients have reported failure in PT in the past, but have no idea of what they were doing or why, and generally were only working on an individual body part instead of working on the entire system. Addressing the deepest part of any injury by addressing all of the body parts that contribute to the problem is more of an unconventional approach in PT than it should be. 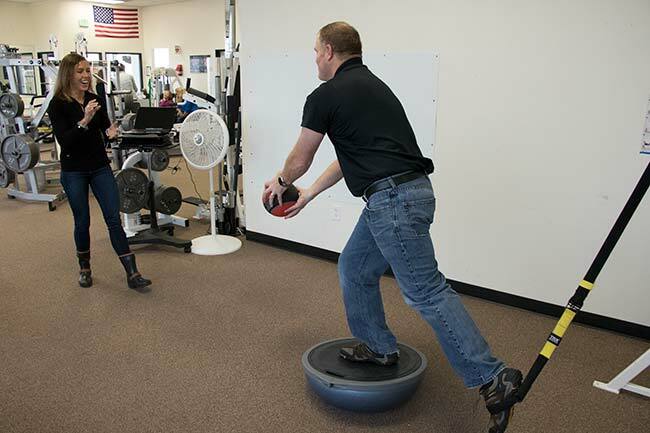 Several members on staff have a unique background in military training procedures, to include understanding return to duty requirements post injury, military entrance performance standards for each branch of the military and how to train through existing injuries to make the grade. For all clients, treatment approach is unique to each individual, from the comprehensive initial evaluation to each subsequent session, where each person is viewed as the unique individual that they are. As no two clients are alike in their histories or their injuries, no two treatment programs will be alike either. The one certainty is that all parts of the body are considered as part of the picture during assessment, treatment design and functional goal setting.